Purchasing the FileCOPA FTP Server Software is very simple. First you must download your free trial copy Here. Use our fully featured trial for 30 days. 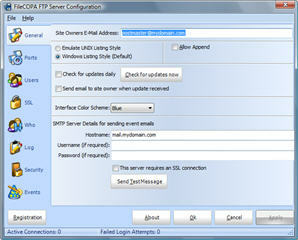 Once you have installed FileCOPA you may easily register it by clicking the REGISTER button on the configuration screen. After 30 days you will be prompted to register before FileCOPA will start. Unlike other FTP Software, FileCOPA is a single price, regardless of how many clients you are expecting to service or if you wish to use SSL or not. InterVations supplies FileCOPA at this single price because we understand companies cannot always know how many sites are likely to connect to them. Busy periods may be followed by long quiet periods. With FileCOPA your customers should never get an unable to connect message. Your license for FileCOPA will come with 12 months of free updates. After 12 months you will need an update subscription in order to continue receiving updates to the FileCOPA FTP Server. If you renew your subscription before your initial 12 months expire then the cost will be 50% of the current license cost. If you renew after your subscription has expired then the cost will be 75% of the current license cost.